Turn to the resource that goes beyond basic coding with the Current Procedural Coding Expert, your CPT® coding resource. 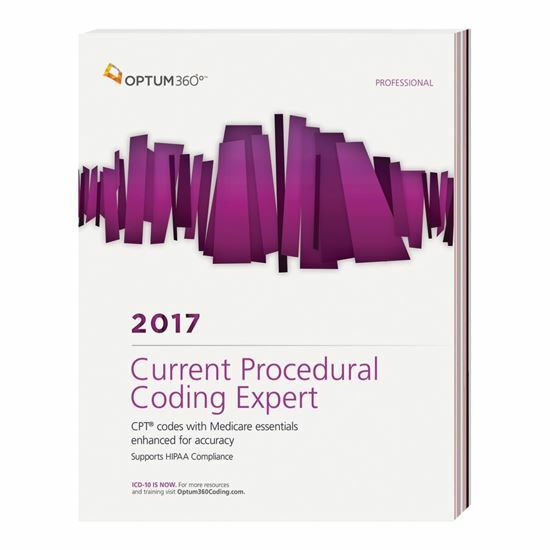 Equipped with the entire 2017 CPT® code set with easy to use coding includes and excludes notes for coding guidance, and Medicare icons for speedy coding, billing and reimbursement, this easy-to-navigate resource will benefit physician practices, outpatient hospitals, and ASCs. You’ll also find a comprehensive listing of annual code additions/changes/deletions/reinstatements in the appendix, new code icons and notes, plus reimbursement information and mid-year changes not found in the American Medical Association’s (AMA) CPT® code books. New — Optum360 Edge —Evaluation and Management Appendix –Easy to use grids and extended guidelines to facilitate E&M code selection. • Optum360 Edge — Code-specific definitions, rules, and references. Reference comprehensive information compiled from the AMA, Centers for Medicare & Medicaid Services (CMS), Optum360, and other sources to assist with accurate coding and speed reimbursement. • Optum360 Edge — Resequenced CPT® code alerts. Identify the AMA’s code ”resequencing” at a glance with our specific instructions, color bars, and brackets. • Optum360 Edge — CCI edit icon. Quickly identify those CPT® codes with corresponding CCI edits.